The most common mistake made in maintaining lawns (bluegrass, ryegrass, and fescue) is mowing too short. The University of Nebraska Turfgrass Science team recommends a mowing height of 3”-3.5” May – late September. This would be the highest or next to highest setting on most walk behind mowers. Riding mowers should be adjusted by measuring from the bottom of the deck to the concrete; a 1, 2, or 3 setting on the mower does not mean inches. They have found that the higher the turf is mowed, the deeper the root system. It has also been proven that taller turf means fewer weeds and less stress during hot weather. Avoid trimming along the sidewalks and driveway with a string trimmer or edger. This process scalps the lawn, exposing the soil to sunlight, drying out the soil and removing the weed preventor applied in the 1st application. The edges will fill up with weeds during the summer. Lawn edging should be done in September or October only. Mole– The eastern mole (Scalopus aquaticus) is the only mole commonly found in Nebraska. They are fairly small animals; as adults, they weigh about three to five ounces and are four to six inches long. Moles spend almost their entire lives underground. 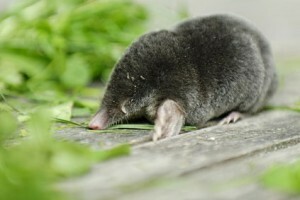 As a result, few people have ever seen a mole. Visit our page on Moles and Voles to learn more about what can you do to Control Turfgrass Damage! Grubs are the larval stage of the common June Beetle. 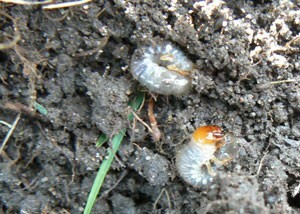 Grubs are one of the most hated lawn pests. This is because they are ravenous eaters, and they affect the lawn and garden during virtually every stage of their life cycle. To effectively control Grubs in your lawn, you need to understand their life cycle. Then, you must know what works and what doesn’t for control. Visit our page on Grubs to learn more about what can you do to Control Grub Damage! There are a lot of reasons why weeds may be abundant in your lawn and it’s often difficult to pinpoint the specific cause. The best defense against weeds is a good offense! A healthy, hearty, actively green growing lawn will choke out weeds, diseases and insects better than a sparse lawn. Proper weed and crabgrass control treatment is the right offense that will produce the lush green weed free lawn you always desired. A post emergent herbicide will knock down weeds that have already germinated and are actively growing. The pre-emergence herbicide works by forming a barrier in the soil, preventing weed seedlings from germinating. These safe and powerful post and pre-emergence herbicides will stop weeds dead in their tracks.